Law of Attraction worksheets are one of my favorite things! I use Law of Attraction worksheets to help me stay focused and at a high vibration. There are so many times I use them – when I feel overwhelmed, when I feel like resistance or limiting beliefs are coming up, when I feel sad, angry, or anxious… A worksheet helps me turn things right around. I will admit that there have been times when I have created a really great worksheet that made me feel like I could manifest anything, and then nothing happened. Sometimes I ended up not using it, or I filled it out but didn't take action towards manifesting my desires. For me, it was always a sign that I wasn't truly aligned with my desire and needed to work on clearing resistance. 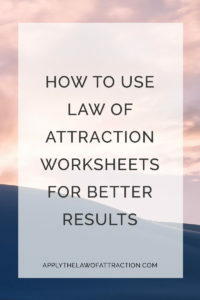 In my years of creating and using Law of Attraction worksheets, I've noticed some things that make a worksheet truly effective at skyrocketing your Law of Attraction results. I wanted to share them with you today in case you wanted some ways to use worksheets more effectively. And if you're completely new to worksheets, I also have some free ones you can download to get started. It amazes me how smooth and productive my day is when I complete my Manifesting My Day worksheet. It helps me to not feel overwhelmed by anything I have to do, helps me to free up time to get more things done, and helps me to intentionally decide how I want my day to go. I also love how I can choose to only focus on those tasks I enjoy, and assign the tasks I don't care for to the Universe to magically take care of themselves. Law of Attraction worksheets can be a great way to only focus on things that make you happy and keep your vibration high! I like to print my worksheets and keep them in a binder. When I get discouraged or notice my vibration is low, I look back over my worksheets. They instantly show me how far I've come and how many wonderful things I have manifested. Even on the days that I only manage small steps towards my goal, I can look back over all my worksheets and see how much progress I've really made, and how I close I actually am to manifesting my goal. 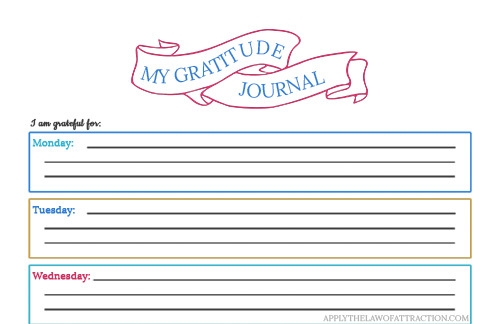 I love to spend a few minutes of each day completing gratitude printables for this reason. It's so easy to complain that time is passing and nothing is happening. When I look back over my printables, I see how much has actually occurred, and that I'm definitely closer to my goal. Seeing how far you've come helps propel you towards your goals as you see signs that you are indeed manifesting your desires. 3. They make it easier to stay focused and take inspired action. This is the most helpful reason for me! My mind is often thinking about 100 things at once, coming up with new ideas, thinking of what I need, planning what I have to do, etc. Having Law of Attraction worksheets helps me keep everything organized so that I can 1) stay focused on manifesting my goals and 2) take inspired action. I can just glance at a worksheet to get me back on track with what I'm creating. Otherwise, I can feel so overwhelmed I either don't take action or the action I take isn't inspired action. 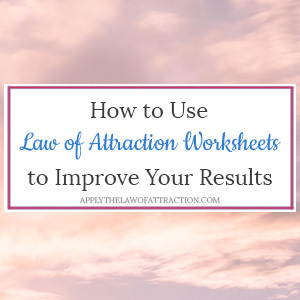 Before you dive in, I want you to be aware of two ways worksheets can block your Law of Attraction results. Perhaps you handle change better than I do, but I've found that when I start to introduce too many new concepts and elements to my manifesting routine, I can't keep up. I remember when I first started trying to introduce someone's 25-step-morning-manifesting-routine into my life. Okay, maybe it wasn't 25 steps, but it sure felt that way. I was so excited to start using it because it had many wonderful promises and testimonials. I couldn't wait to see how his process could improve my results. Do you know how long I stuck with it? Only 2-3 days. It was overwhelming! I was trying to get up early every day to jump around, imagine money falling from the sky, complete one worksheet after another… It was so much at once, I couldn't commit to everything. I have had success, however, when I apply one new worksheet at a time. I like to commit to using a new one for a certain period of time, such as a week or two. At that point, it becomes a part of my routine and I can tell whether it is improving my results or not. When I'm ready, I'll add another worksheet. Yes, you read that right. And I think we're all guilty of this at times! Sometimes it's easy to fall into the trap of completing worksheets because you feel like you're taking action to manifest your desires when you're really avoiding taking tangible steps. Sometimes you may even see them as a tool or technique that will make your desires manifest faster when you're really using them to avoid looking at resistance that's blocking you from achieving your goals. I Know I've spent many hours completing a detailed worksheet to help me plan out something I want to manifest…or one filled with concrete questions to ask myself to get to the root of resistance and limiting beliefs. Completing the worksheet made me feel like I was taking steps towards my goal or steps towards getting rid of the resistance, but I was really procrastinating. I could have filled out a thousand worksheets, but they wouldn't have gotten me closer to manifesting my desires. But that doesn't mean worksheets aren't helpful! Law of Attraction worksheets truly improve my results when I use them effectively, as I described above. The key is to remember they are a tool to help you manifest, but you still have to do the work yourself. They won't manifest anything without you cleaning up your resistance and limiting beliefs, keeping your vibration high, etc. I've always used a variety of different Law of Attraction worksheets to help me improve my results, often creating them as I need them…even though it usually takes me hours to create just one. I want to share with you some worksheets I use daily. You can download them for free, but please understand that they are for your personal use only. I don't want to overwhelm you, so I'm keeping the number of worksheets small for now. If there's enough interest, I can share more. Let me know in the comments below about your experiences with Law of Attraction worksheets. Great article. Can you give examples of what you put on your worksheets? i.e. tasks you might assign to the Universe or examples of your daily goals. As I stated in the article, I assign the Universe things I have to do that I don’t want to do. My daily goals are things I have to do for the day. Hey. I’ve been trying worksheets for a week now & I’d like to share my experience with you guys. I’ve been aware of LoA for 2 months. I’m a college student. And I must admit my last two years had been very pathetic acadmically as well as personally. I was literally failing in exams & had undergone breakup with a guy with whom I was in a relation for 3 years. Fastforward : I’ve been trying LoA for 2 months but couldn’t fetch much results. This week had been full of surprises, I’ve been getting free rides, free meals, cool jackets on sale & what not!!! Gratitude has shifted all the bad luck away & brought in good luck!!! I feel super lucky!!!! Oh & I forgot to tell you I had been crushing on a guy since June,2015 (I felt I had no chance with him before) but two days ago he sent me friend request on Facebook. Life has changed!!! What are you waiting for? Just go for it!! !